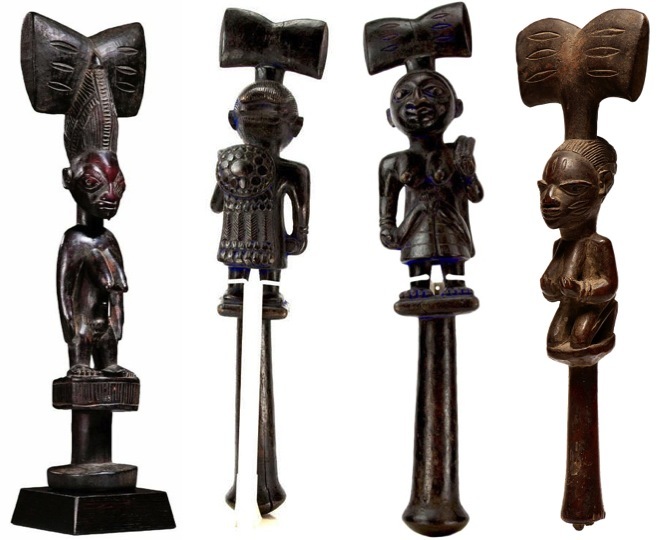 Originally created for the court of kings in Oyo, ose Sango (sometimes spelt oshe Shango) staffs quickly spread to other sub-groups within the Yorubaland. Associated with the worship of the god of thunder and lightning, Sango, and representing his destructive power, ose Sango staffs are carried by worshippers and followers as a sign of devotion to the god. Although prone to destruction, Sango is also believed to be a generous, life giving, god and as such all ose Sango staffs are carved with a double-ax motif at the summit of a wooden shaft (to represent both his wrath and blessings). The double ax is also a representation of thundercelts / neolithic stone celts (edun ara) that the Yoruba believe to be thunderbolts hurled from the sky through lightning by Sango. During annual Sango festivals, Sango possessed worshippers carry their individual ose Sango staffs as dance wands while singing Sango praise songs. When not being used, the staffs are used to decorate shrines dedicated to Sango.